Israeli forces killed 3 Palestinian civilians in the West Bank. 3 Palestinian civilians from Um al-Fahm were killed in an armed clash inside al-Aqsa Mosque yards. 35 Palestinian civilians, including a child, were wounded in the West Bank and Gaza Strip. Israeli forces conducted 58 incursions into Palestinian communities in the West Bank and 8 ones in Jerusalem. 57 civilians, including 5 children, 3 girls and a journalist, were arrested. 26 of them, including 2 children and the 3 girls, were arrested in Jerusalem. Ramasat and Palmedia offices in Hebron were raided. The Islamic Call to Prayer (Adhan) was banned in al-Aqsa Mosque as an unprecedented measure. 58 Islamic Endowments’ (Awqaf) officers, including the current and former Grand Muftis of Jerusalem and Palestine. 2 fishermen were wounded off Khan Yuins shore, south of the Gaza Strip. 4 civilians were arrested at military checkpoints in the West Bank. Israeli violations of international law and international humanitarian law in the oPt continued during the reporting period (13 – 19 July 2017). At approximately 01:00, Israeli forces moved into Surif village, southwest of Hebron, and stationed in al-Matinah area. They raided and searched a house belonging to Husam ‘Amer Abdul ‘Aziz Hadoush (34) and then handed him a summons to refer to the Israeli Intelligence Service in “Gush Etzion” settlement complex, south of Bethlehem. At approximately 02:00, Israeli forces moved into al-‘Aroub refugee camp, north of Hebron. They raided and searched a number of houses and then arrested 3 civilians namely Mohammed Khaled al-Balasi (22), Mohammed Fathi Shuhadah (24) and Mo’ayad Sami al-Sharbi (21). At approximately 03:00, Israeli forces moved into Hebron and stationed in Wad al-Tuffah Street. They raided and searched al-Maha building and raided Ramsat News Agency. They broke the main door and confiscated 4 hard disks. They also raided and searched al-Quds Satellite Channel of Pal Media News Agency. The soldiers broke the main door and confiscated 6 hard disks as well. They later withdrew and no arrests were reported. Around the same time, Israeli forces moved into Marakah village, south of Jenin. They raided and searched several houses and then arrested ‘Ali Nafe’ Mousa (38). 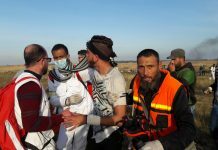 At approximately 10:40, Israeli forces stationed along the border fence between the Gaza strip and Israel, east of Gaza Valley in the central Gaza Strip, opened fire at shepherds and farmers, who were present in the area. As a result , the farmers and shepherds were forced to flee fearing for their lives, but no casualties were reported. Note: During the aforementioned day, Israeli forces conducted (3) incursions in the following areas and no arrests were reported: Dura and al-Hadab village in Hebron and Howarah village, south of Nablus. At approximately 02:00, Israeli forces moved into Rahhal valley area, south of Bethlehem. They raided and searched a house belonging to the family of Mohammed Isma’il al-Fawaghra (64). They then arrested the aforementioned person and took him to an unknown destination. In a new crime of excessive use of force, Israeli forces killed a Palestinian young man and wounded 2 others when the Israeli forces moved into al-Dheisheh refugee camp, south of Bethlehem, to carry out an arrest campaign as dozens of Palestinian young men protested against them. According to PCHR’s investigations, at approximately 06:00 on Friday, 14 July 2017, Israeli forces accompanied with several military jeeps and dozens of infantry units moved into al-Dheisheh refugee camp, south of Bethlehem. They stationed in the center of the main street, and the soldiers stepped out of the jeeps and surrounded many houses in order to raid them. The soldiers raided and searched 2 houses belonging to Mo’ath Abu Nassar and Mohammed ‘Obaid and then arrested them. In the meanwhile, dozens of Palestinian youngsters gathered and threw stones and Molotov cocktails at the Israeli soldiers, who immediately opened fire at them. As a result, 3 civilians were wounded, two of them were wounded in the lower limps while Baraa’ Isma’il Hamamdah (18) sustained 4 live bullet wounds to the chest, abdomen and neck. An ambulance of the Palestine Red Crescent Society (PRCS) immediately transferred the wounded civilians to al-Hussein Hospital in Beit Jala. After a while, Baraa’ was pronounced dead succumbing to his wounds. Note: During the aforementioned day, Israeli forces conducted (4) incursions in the following areas and no arrests were reported: Qalqiliyah, Halhoul, Yatta and al-Fawar refugee camp in Hebron. Note: During the aforementioned day, Israeli forces conducted (5) incursions in the following areas and no arrests were reported: Qalqiliyah and Ematin village, northeast of the city; Salfit, Dura and Ethna villages in Hebron. At approximately 01:00, Israeli forces moved into Hebron and stationed in Abu Roman Mount area. They raided and searched a house belonging to Farahat Khalil Ghieth (60) and then arrested his son Mohammed (23). At approximately 03:00, Israeli forces moved into Beit Ummer village, north of Hebron. They raided and searched a house belonging to ‘Arafat ‘Essa al-Za’aqiq, whose son ‘Arafat was killed by the Israeli forces on 27 November 2015, in Abu al-Towq area, east of the abovementioned village. The Israeli forces claimed that he attempted to carry out a stab attack against Israeli soldiers. The soldiers confiscated ‘Arafat’s car, which costs about NIS 70,000, claiming that he received that amount of money from illegal bodies. Moreover, the Israeli forces raided and searched a house belonging to Jasem Fouad Abu ‘Ayash in ‘Asidah area. They also searched the area around the house and withdrew later. No arrests were reported. At approximately 05:00, Israeli forces accompanied with more than 30 military jeeps and a group of Israeli undercover agents “Musta’ribin”dressed like Palestinian civilians and supported by a drone moved into Kafer ‘Ein village, northwest of Ramallah. The soldiers surrounded 3 poultry farms belonging to Mohammed Lutfi Hasan al-Terawi, Ashraf al-Remawi and an expatriate civilian, who owns an uninhabited house comprised of 2 rooms. All of these farms are located in ‘Ein al-Jadidah area in the eastern outskirts of the abovementioned village. When the Israeli forces moved into, sound of heavy shooting was heard in the area. At approximately 06:00, information was leaked to the residents that there is a dead body in the farms. After the Israeli forces withdrew at approximately 06:30, a number of the residents rushed to the abovementioned area and saw a pool of blood in the uninhabited house and blood signs on the main street, but they did not find any corpse. They later knew that the Israeli forces killed ‘Ammar Ahmed Hasan Lutfi al-Terawi (34) and arrested his cousin Lutfi Mohammed Hasan al-Terawi (28), who was in his father’s farm. They kept the dead body under custody. Following this crime, the Israeli forces declared that “Yamam” Unit, which is one of “Musta’ribin” units, and another Israeli unit from the “Shabak”, shot al-Terawi dead. They also claimed that al-Terawi pointed his weapon at the soldiers when they went to arrest him, so they opened fire at him. However, PCHR was not able to reach a local eyewitness to confirm or refute the Israeli claims, particularly because the Israeli forces arrested the only eyewitness on this crime. PCHR will continue to investigate in the circumstances of this crime. It should be mentioned that the “Yamam” Unit is an Israeli counter-terrorism unit, one of four special units of the Israeli Border Police, and is specialized, among other tasks, in carrying out attacks against Members of Palestinian armed groups. According to PCHR’s documentation of many attacks carried out by “Musta‘ribin” Unit against activists during al-Aqsa Intifada, members of this Unit used to kill Palestinians, claiming they are wanted, instead of arresting them. At approximately 07:00, Israeli gunboats stationed offshore, northwest of Beit Lahia village in the northern Gaza Strip, opened fire at Palestinian fishing boats sailing within 3 nautical miles and chased them. As a result, the farmers were forced to flee fearing for their lives, but neither casualties nor material damage were reported. Khader Yasser Mahmoud Abu Shammalah (24) from Khan Yunis. He sustained a live bullet wound to the right leg. Note: During the aforementioned day, Israeli forces conducted (3) incursions in the following areas and no arrests were reported: Sa’ir, al-Thaheriyah and al-Koum villages in Hebron. At approximately 01:00, Israeli forces moved into Qaryout village, southeast of Nablus. They raided and searched a number of houses and then arrested Mo’tasem Mesleh Ahmed Badawi (20). Around the same time, Israeli forces moved into al-Douha village, west of Bethlehem. They raided and searched a house belonging to the family of Ayman Fadel Daghamin (24). They arrested the aforementioned person and withdrew later. At approximately 01:30, Israeli forces moved into al-Moghir village, northeast of Ramallah. They raided and searched several houses and then arrested Sami Sobhi al-Haj (26). Around the same time, Israeli forces moved into Beit Rema village, northwest of Ramallah. they raided and searched a number of houses after which they arrested Hutheifah Jaber Abu ‘Alyaa’ (19). At approximately 02:00, Israeli forces moved into al-Samou’, south of Hebron. They raided and searched a number of houses from which they arrested Mahmoud Bashir al-Hawamda (23) and Arafat Soboh al-Salameen (25). At approximately 03:30, Israeli forces moved into Qalqiliyah . They raided and searched a number of houses after which they arrested 3 civilians, including 2 children, namely Hasan Mohammed Morjan (48), his son Aws (17) and ‘Alaa’ Nehad Abu ‘Asab (17). At approximately 10:30, Israeli forces accompanied with 2 military jeeps moved into ‘Azoun village, east of Qalqiliyah, from the northern entrance to the village. They patrolled in the streets amidst firing sound bombs and tear gas canisters. As a result, a number of civilians suffered tear gas inhalation. At approximately 10:50, Israeli forces arrested Mohammed Shaker Wajih Hbais (35) from Qalqiliyah after he received a summons to refer to the Israeli Intelligence Service in “Eyal” crossing. Note: During the aforementioned day, Israeli forces conducted (3) incursions in the following areas and no arrests were reported: Ethna, al-Shyoukh and Surif villages in Hebron. At approximately 01:00, Israeli forces moved into Sha’abah area in Hebron. They raided and searched a house belonging to the family of Hazem Jamil al-Ja’bari (29). They then handed him a summons to refer to the Israeli Intelligence Service in “Gosh Etzion” settlement, south of Bethlehem. At approximately 01:15, Israeli forces moved into Hares village, north of Salfit. They raided and searched a house belonging to Ashraf Jamal ‘Ali Abed Jaber (22) and then arrested him. At approximately 02:00, Israeli forces moved into Nablus. They raided and searched several houses and then arrested Mohammed ‘Adnan al-Khalili (22) from his house on Baker Street. Around the same time, Israeli forces moved into ‘Asker refugee camp, northeast of Nablus. They raided and searched several houses and then arrested journalist Redwan Suleiman Qatanani (28). It should be noted that Qatanani is a reporter at Palestine Post and Arabi 21 News Companies. Around the same time, Israeli forces moved into Beit Ummer village, north of Hebron, and stationed in Bahar neighborhood. They raided and searched a house belonging to Jamil Yusuf Husain Masharqah (50) and then informed him to turn his son Khaldoun (25) into the military watchtower established at the eastern entrance to the village. At approximately 03:00, Israeli force moved into Tammoun village, southeast of Tubas. They raided and searched several houses after which they arrested Khaled Hasan Bani ‘Oudah (22). At approximately 10:30, Israeli forces accompanied with 7 military jeeps and an armored personnel carrier moved into the eastern entrance to Qalqiliyah. They patrolled the streets of Kafer Saba, Khelet Noufel neighborhoods, Dawoud southern neighborhood and Khelet al-Ra’ei neighborhood. They raided and searched a house belonging to Mohammed ‘Asem Jaber Nazal (25) near the Islamic Da’wah Faculty and then arrested him. At approximately 13:20, Israeli forces killed Ra’fat Nathmi Shukri Herbawi (29) from al-Karm Valley neighborhood in the western area in Hebron after opening fire at his car near Beit ‘Einoun intersection on Bypass Road (60). The Israeli forces claimed that Ra’fat attempted to carry out a run-over attack against the soldiers stationed near the Abovementioned Street. Ra’fat’s body was taken by an Israeli military ambulance to an unknown destination. An eyewitness said to PCHR’s fieldworker that he saw a car with an Israeli registration plate veered off twice towards a number of soldiers stationed on the road. As a result, a number of the Israeli soldiers were wounded before opening fire at the driver. Few minutes later, another car stopped as an Israeli settler known very well as “‘Ofer” by the eyewitness. The settler fired several live bullets from his gun at the driver. Note: During the aforementioned day, Israeli forces conducted (7) incursions in the following areas and no arrests were reported: Qalqiliyah and ‘Azoun village, east of the city; Surif, Bani Na’im, al-Koum; Deir al-‘Asal and Beit Awa villages in Hebron. At approximately 01:00, Israeli forces moved into Beit Ummer village, north of Hebron. They raided and searched a house belonging to Ibrahim Hamdi Abu Maria and then arrested his son Kareem (17). At approximately 01:30, Israeli forces moved into Salem village, northeast of Nablus. They raided and searched several houses and then arrested Ahmed ‘Antar Hamdan (20) and Fadi Ghassan Jobarah (27). At approximately 02:00, Israeli forces moved into al-Nabi Saleh village, northwest of Ramallah. They raided and searched a number of houses and then arrested ‘Anan Mahmoud al-Tamimi (21) and Omer Saleh Ayoub (26). Around the same time, Israeli forces moved into Marah Rabah village, south of Bethlehem. They raided and searched a number of houses after which they arrested Khalil Mohammed al-Sheikh (20). Around the same time, Israeli forces moved into Marba’et Sabtah in Hebron. They raided and searched a metal workshop belonging to Maher Abed al-Hai al-Jo’bah. They broke the main door and confiscated a number of hand tools and machines form it. The soldier then withdrew, but no arrests were reported. Around the same time, Israeli forces accompanied with 5 military jeeps moved into the southern area in Hebron. They raided and searched 2 houses belonging to Hani Mohammed Makroum Gheith and Hazem Theeb Gheith. They later withdrew, but no arrests were reported. At approximately 04:00, Israeli forces moved into Taqou’ village, east of Bethlehem. They raided and searched a number of houses after which they arrested Naser Mohammed al-Sabah (34). Note: During the aforementioned day, Israeli forces conducted (3) incursions in the following areas and no arrests were reported: Sa’ir and Hadab al-‘Alaqah villages, and northern neighbourhoods in Hebron. On Sunday, 02 July 2017, Israeli forces allowed the exportation of 22.7 tons of tomatoes; 4.8 tons of eggplants; 3.6 tons of sweet peppers; 3.2 tons of peppers; 5.1 tons of cucumbers; and 0.6 tons of fish. On Monday, 03 July 2017, Israeli forces allowed the exportation of 12.8 tons of tomatoes; 2 tons of eggplants; 2.4 tons of sweet peppers; 5.1 tons of cucumbers; 430 piece of animals skin; and 25 tons of Aluminum scrap. On Wednesday, 05 July 2017, Israeli forces allowed the exportation of 11 tons of tomatoes; 0.4 tons of eggplants; 24.5 tons of sweet peppers; and 12.7 tons of cucumbers; 13 tons of Aluminum scrap and 0.36 tons of garlics. On Thursday, 06 July 2017, Israeli forces allowed the exportation of 20 tons of tomatoes; 6 tons of eggplants; 8 tons of clothes; and 0.5 tons of fish. On Sunday, 09 July 2017, Israeli forces allowed the exportation of 19.5tons of tomatoes; 2.4 tons of eggplants; 2.4 tons of sweet peppers; 14 tons of cucumbers; and 5 tons of sweet potatoes; and 13 tons of Aluminum scrap. On Monday, 10 July 2017, Israeli forces allowed the exportation of 13 tons of tomatoes; 3.8 tons of cucumbers; 2 tons of sweet peppers; 9 tons of clothes; 0.7 tons of fish; 400 piece of animals’ skin and 0.19 tons of garlic. On Wednesday, 12 July 2017, Israeli forces allowed the exportation of 25.3 tons of tomatoes; 23 tons of cucumbers; 5.6 tons of sweet peppers; 2.1 tons of sweet potatoes; and 0.6 tons of fish. On Thursday, 13 July 2017, , Israeli forces allowed the exportation of 24.3 tons of tomatoes; 3.2 tons of eggplants; 23.6 tons of cucumbers; 2 tons of sweet peppers; 0.6 tons of fish; and 430 piece of animals skin. On Wednesday, 12 July 2017, Israeli authorities allowed 3 persons working at international organizations and international persons to renew their permits. On Friday, 14 July 2017, Israeli authorities allowed one person to return to the West Bank. On Thursday, 13 July 2017, Israeli forces established 3 checkpoints at the entrances to Samou’a, Beit ‘Awaa and Beit Kahel villages. On Friday, 14 July 2017, Israeli forces established 3 checkpoints at the entrances to al-Fawar refugee camp, Ethan and Imrish villages. On Saturday, 15 July 2017, Israeli forces established 3 checkpoints at the entrance to al-‘Aroub refugee camp, at the northern entrance to Hebron and at the entrance to Bani Na’iem village” Wad al-Jouz”. On Sunday, 16 July 2017, Israeli forces established 3 checkpoints at the northern entrance to Halhoul village, at the southern entrance to Hebron (al-Fahs) and at the entrance to Deir Samet village. On Monday, 17 July 2017, Israeli forces established 4 checkpoints at the eastern entrance to Dura, at the entrance to al-Shayyoukh village, at the entrance to Beit ‘Aynoun village and at the southern entrance to Yatta village. On Tuesday, 18 July 2017, 3 similar checkpoints were established at the entrance to Sa’ir village, at the northern entrance to Halhoul village and on the road of Jalajel village. On Wednesday, 19 July 2017, Israeli forces established 5 checkpoints at the entrances to Sa’ir, Beit Ummer and Tarama villages; at the entrance to al-Fawar refugee camp and on Beit ‘Aynoun road. On Thursday, 13 July 2017, Israeli forces established 4 checkpoints at the eastern entrance to Qalqiliyia (was established twice) and at the entrances to ‘Azoun and Heijah villages, east of the city. At approximately 18:20 on Friday, 14 July 2017, Israeli forces established 2 checkpoints at the entrance to ‘Azoun village, east of Qalqiliyia and under the bridge of ‘Azoun village on road between Qalqiliyia and Tulkarm. At approximately 19:20 on Monday,17 July 2017, Israeli forces established a checkpoint at the entrance to Kafur Laqif village, east of Qalqiliyia. At approximately 01:50 on Tuesday, 18 July 2017, a similar checkpoint was established at the eastern entrance to the city. At approximately 11:30 on Thursday, 13 July 2017, Israeli forces established a checkpoint at the entrance to Qarawat Bani Hassan, northwest of Salfit. At approximately 20:20 on Friday, 14 July 2017, Israeli forces established a checkpoint at the northern entrance to Salfit. On Saturday, 15 July 2017, Israeli forces established 3 checkpoints at the northern entrance to Salfit; at the intersection of Kafur al-Deek village, west of the city; and between Bidiyia and Masha villages, northwest of the city. At approximately 18:20 on Monday, 17 July 2017, Israeli forces established a checkpoint at the northern entrance to Salfit. At approximately 02:00 on Thursday, 13 July 2017, Israeli forces moved into Qalandia refugee camp, north of occupied East Jerusalem. They raided and searched houses from which they arrested Bilal Sami and Abdullah Mohamed Abed al-Rahman. At approximately 04:00 on Thursday, Israeli forces moved into al-Salam Suburb near ‘Antabah village, northeast of occupied Jerusalem. They raided and searched a house belonging to Samer Ayoub al-Joulani (23) and arrested him. At approximately 00:00 on Friday, 14 July 2017, Israeli forces moved into Ras Khamis area in Sho’fat refugee camp, north of occupied Jerusalem. They raided and searched a house belonging to Saher Hamouda (18) and arrested him. At approximately 23:00 on Sunday, 16 July 2017, Israeli forces moved into al-Ram village, north of occupied Jerusalem. They patrolled the area and then arrested Zuhir Da’nah (16). On Monday afternoon, 17 July 2017, Israeli forces moved into ‘Ain al-Louza neighbourhood in Silwan village, south of occupied Jerusalem’s Old City. They raided and searched houses. As a result, dozens of Palestinian young men gathered and threw stones and fireworks at them. The Israeli forces indiscriminately fired live bullets and rubber-coated metal bullets at the young men. As a result, ‘Alaa Tawfiq Abu Taieh (19) was hit with a live bullet to the pelvis and was then taken to al-Maqased Hospital in al-Tour neighbourhood, east of the city. ‘Alaa’s father said that his son was wounded while returning to his house and then taken to al-Maqased Hospital, where medical sources classified his health condition as serious. ‘Alaa underwent a critical surgery to stop the bleeding, but he still needs other operations. Few minutes later of his arrival at the hospital, the Israeli forces raided the hospital and then headed to the Operation Room (OR) and Emergency Department. After that, they surrounded the Intensive Care Unit (ICU) and checked the IDs of the medical crews and workers. The Israeli forces also searched some visitors and patients. When the Israeli forces withdrew from the hospital, they stationed at the hospital gates and surrounded the hospital until next day afternoon. On Tuesday, 18 July 2017, Israeli forces arrested 4 Palestinian civilians from various areas in Jerusalem and took them for investigation. The arrested persons were identified as Fadi Mtour; Rabie’ Rezeq Rabie’ (50); ‘Adnan Abu Subaieh (28), who works at the Islamic Endowments (Awqaf) Department; and Hamza al-Shurbati, who works as a guard in the Mosque. At approximately 01:00 on Wednesday, 19 July 2017, Israeli forces moved into Silwan village, south of occupied Jerusalem’s Old City. They raided and searched houses from which they arrested Loay al-Rajabi (21) and Mohamed Abu Subaieh (21). At approximately 22:00 on Wednesday, Israeli forces moved into Beir Ayoub neighborhood in Silwan village, south of occupied Jerusalem’s Old City. They raided and searched a house belonging to Mahran Showaiki (14) and arrested him.